What's so great about Victoria Island in British Columbia? First, there is a nice ferry ride from Vancouver to this island. 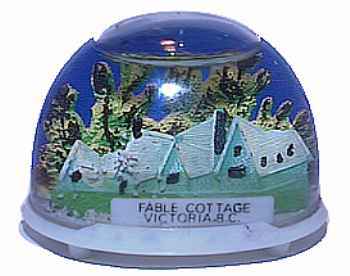 Once there, be sure to visit Butchart Gardens, You can also go to Fable Cottage, or you can just look at this snowdome. Update on 2/27/2001. I was informed by a descendant of the man who built Fable Cottage that it was torn down.This is all that is left? 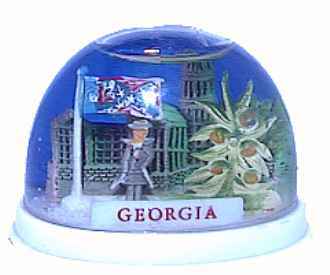 Georgia is a big big state to drive through. There are a lot of places to visit and things to see. Macon, for example, is full of stately old southern mansions. Go there during their Cherry Blossom festival. Georgia has been in the news lately for flying the Confederate Battle Flag. Yep, they even show one in this snowdome. Chattanooga is just across the Tennessee border when leaving Georgia. Their signs proclaim it the home of the Chattanooga Choo Choo, a nicely restored railroad station with old trains on display. 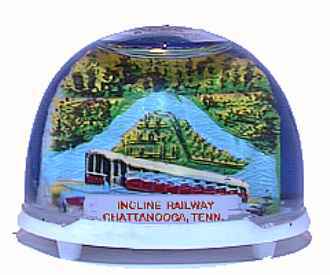 Since Chattanooga sits on the side of a mountain, there is an inclined railway for tourists to ride. The railway was closed, but the nearby gift shop had some dusty old snowdomes. It looked like we were the first customers in months. I had never seen snowdomes in a gift shop with green water and mold inside. I took this home and gave it a shot of chlorine bleach, followed by a water transfusion.